Regarding other/further information. At the appearance of the book-series on the historical Moses, there was an increase of public interest in Ove von Spaeth's background as a writer. This revealed a disproportion of interest in the author rather than in the exceptional ancient historical source material, argumentations, and individual personality Moses himself as a principle character and raison d'etre of the books. This approaches a modern tendency that authors are exposed as a brand and their books to aspire to big business. But it is a common experience that serious research working is carried out better under peaceful circumstances - preferable to most writers as to the quality of their results. However, reasonable causes may prevail for a demand for partly private information on the background of more than 25 years of working with 5 volumes on Moses' history - as such task was never done before. In the following, several savvy writers have helpfully presented some parts of the course of events, - some mini-biographical notes. At an early age Ove von Spaeth's particular interest in history and astronomy developed to a keen desire for further knowledge about the sky and the firmament, and gradually also for the way we have understood these conditions to and their influence on our religions and ways of thinking. In this relation he started to build up his later so huge private library and archives (more than six thousand volumes/titles, non-fictional and equal amounts of copies of articles and books). The old family background of Ove von Spaeth is originally a German-Polish nobility family - settled in Denmark in 1729 - of originating in Wittenberg. On the map: it is the German city where Giordano Bruno lectured, and where Luther advertised his theses - in the Grand Duchy of Anhalt-Zerbst, from where Russia's Queen Catherina the Great originated, and where the place or castle by the name Spaeth was to be seen. In the Danish seaport Elsinore (Helsingoer) the family in 1756 had built and possessed through a century a - still existing - classical style mansion. In 1777 the von Spaeth family, after foreign military service for the Russian Zar, was also neutralized as Danish nobility and had an accordingly change made in their coat of arms, today to be carried on by Christian, the son of Ove von Spaeth. It was an old family of officers, an almost uninterrupted line of generals and naval commanders with no exact tradition for - and in later times neither the means for - a continued book learning now as in the case of the comming author. And architect (preferably) or musician were in reality unavailable perspectives in times prior to students' grants. Through some harsh years, to make a living he started off rather young as a printer's apprentice. Nevertheless, extensive private studies on his own - led to many often less treaded paths, from where a lot of exciting, untraditional knowledge of many lines of study have been collected - an extensive expedition through history, time, and space. This was also a beginning of utilizing the experiences and many of the results in his publications and articles on these and thematic related subjects. In addition to the writing of books and later also to develop to the journalistic works - the activities took place in the author's studios in both Denmark and abroad for several years (e.g. in Andalucia, Spain), as well as Ove von Spaeth's study tours and other explorations in all continents. However, the natural inner journeys, essential and inspired by the studies, travels, discoveries, and personal considerations showed also to be especially prolific and influential. Ove von Spaeth also has a background parallel in an artistic education - and in his early age he passed the final diploma examination in Graphic Design from The Graphic Arts Institute of Denmark, by a education and training lasting several years. Later, he lectured and instructed here as an adjunct instructor, for some time. He established his own design company for creating and producing book designs, magazines in new design (prize winning), graphic trademarks and logos (some designs to be chosen and published by the prestigious international Swiss journal, Graphis Annual). In the decades following the 1960's became rather well-known for his innovative art publications and articles relating to Indian music, art, and spirituality. His psychedelic poster designs and pop-art are now housed at the archives of Denmark’s Royal National Library, and Design Museum Denmark (earlier named for Fine Arts) in Copenhagen, and the Poster Museum in Aarhus. In 2011, this art collection became the subject of a public retrospective study. And for a couple of years he made graphic design, too, for the The Danish Ministry of Foreign Affairs and directly for Danish government's Minister of Cultural Affairs. Also, at an early stage Ove von Spaeth had some books of his own published - in general characterized as successful experimenting literally, journalistically, and graphically (and even received with enthusiasm by great writers and critics, e.g. Dan Turèll, Rolf Gjedsted, Hans Jorgen Nielsen, Erik Thygesen, and Thomas Winding). At the University of Copenhagen during some terms he incorporated studies of Chinese languages (on dispensation due to the craftsman education, i.e. a non-academic background). However, the multi-task work had to be reduced because the history studies and research gradually took up more and more time. Eventually, research, and publication have been the very, and only, focus. 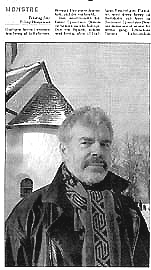 In the 1970's, Ove von Spaeth began studying ancient history, religions, and astronomy. His analysis of the world's oldest star-map from Egypt - the ‘Senmut star-map’ - was first published in 1984 and developed further in 1996-2000. The ground-breaking results appeared in Centaurus, the international history of science journal, vol. 42 (2000). This venture led, in the years between 1999-2005, to further studies in ancient Egypt resulting in a series of five books on the historical Moses and his Egyptian background. Coat of arms of the Von Spaeth noble family, - and the original mansion of 1756 in Elsinore. New discoveries with interesting finds concerning the enigma of Moses are re-establishing important historical coherence - now being presented in the book-series 'Assassinating Moses'. In these books a unique historical material is vitalizing the both fantastic and dramatic background for Moses in Egypt. Moses belongs to the most well-informed and spiritual personalities of our early history. The vast amount of new, exciting information about the fate and mystery of Moses were found after thorough investigations lasting many years. The great uncovering was executed by tracking down the many, often repressed sources and relate them to the recent conquests of research. Since the publication of the first book of the five volume-series many inquiries have been received as to the creation of the books and the procedures used by the writer. The present article will inform about relevant features of a sequence of events lasting several years, with special detours and important milestones - a personal introduction to the writer's reasons for being occupied with the subject, and about the objective of the unusual project. The fact that the cosmos, the huge space with stars and planets and the sun, our eternal vigorous source, is of so decisive importance for each of us as individuals, irrespective of our different ways of living, remains all valid also if we live in places where the sky can rarely be seen, and even whether we are conscious at all of the existence of these conditions. These celestial circumstances have become so much a matter of course to us that they are often receding into the background now in favour of more immediate things that usually are occupying our attention. read about how other peoples throughout history have understood these conditions. There was so much to learn and adapt, and gradually I became aware that it was indeed necessary that I got a huge library of my own. After some years my library comprised around 5,000 volumes - mostly professional topics and editions of the texts to be studied. An invaluable aid through the many years before the Internet. Also, I read about our historical relationship with astronomy and its influence on our religions and the ways of thinking. In other words, the mystery of existence in a cosmic perspective relating to our ways of beliefs in western religions - would it be possible to combine these elements at all? "Thou shalt love thy neighbour as thyself" - the biblical Commandment so well known, is by many people related to the learning of Jesus. But Jesus was quoting Moses! (from Leviticus 19;18). This very commandment has been considerably influential through times. So, who was this Moses, who lived almost 1,500 years prior to Jesus? Moses was the earliest known historical person who initiated a religion. A religion which became a deep inspiration to the three main religions, i.e. Judaism, Christianity, and Islam. And simultaneously a religion which for posterity based itself in its own special book, the Bible, the world's most wide-spread and read book, the oldest parts of which especially Moses has written, according to the tradition. In several parts of the Bible can be found a number of serene rules of conduct and ethical claims, but also - according to modern times concepts - robust and cruel features. How can this be compatible - did the same person write both parts? And almost 3,500 years after the works of Moses - how could it be meaningful at the present that some groups are trying to live according to the most severe, literal "understanding" of these texts? Especially when such disputed ways of understanding also can be experienced so destructively used in connection with huge, political and ethnic-religious problems of our era? Since then and along the way - could something have happened to the texts late after they were created? Many questions like these had been "aroused" in me, when I, independently, started a number of special studies. Through my early founded interest on history and astronomy - many years before my first book on Moses was published - I got acquainted with the world's oldest star map. 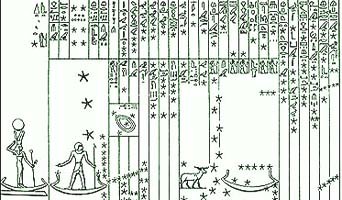 It is a beautifully made, ancient Egyptian survey of the sky designed in a special form, much different from our way of doing these things. The map was made by the most gifted person of that time, Senmut (or Senenmut), minister-in-office of Queen Hatshepsut. After having studied, independently, several subject lines like history, religion-traditions, astronomy, old star lore, the myths of Antiquity, etc, I gradually realized, that this star map dates from the epoch specific of Moses. The map proved to describe a certain constellation in the sky in 1534 BC. The relation was supported, furthermore, by indications from the historians of Antiquity concerning the chronology connecting to Moses. However, by closer investigating the historical events of Moses, I soon discovered that within existing research there is a lot of internal confusion about this important figure. Without having been first introduced to theological hypotheses about Moses - capable of drawing investigations in a certain direction - I tried from the very beginning to maintain a broad view all around. But also without an idea about the extensiveness of the subject, I worked methodically uncovering everything relevant, i.e. often rare material about Moses and chronology. This was to last for many years. It was during these investigations that the star map was dated. In July-August 2000 the result was published as a scientific treatise in the "Centaurus International Magazine of the History of Mathematics, Science, and Astronomy" (Vol. 42). Prior to this I was fortunate enough to have my discoveries about the historical Moses accepted by C.A. Reitzel Publishers, Copenhagen, a tradition-ridden publishing house for the universities, and I was also comfortable with the fact that this was the original publishing house of Soeren Kierkegaard and Hans Christian Andersen. The huge material turned into becoming the book-series, "Assassinating Moses"; and here in the second volume an edition of the star map treatise was included. Also, I had the pleasure of being a referee/reviewer with the "Isis Journal of the History of Science", the world's biggest and oldest international science-history magazine. During these long-lasting studies the enormous Moses bibliography was established (also reproduced in the books). And it was encouraging too that for instance the Jewish National and University Library in Jerusalem had started to buy this (Danish) series of books. The world's oldest star map, Egypt 1,500 BC. Ceiling decoration in the tomb of Senmut, the vizier. Without realizing it from the beginning I had started a completely new project only by originally wanting to write a by-line to a picture of the star map. All of a sudden the text took up one whole page. And very soon also a complete article. Based on many years of intensive work with the relevant historical and spiritual subjects, it proved that actually I knew a lot, which I had not realized at that time. This knowledge and connection were within me, but at a kind of stage like the toy of a transparent glass ball with shakeable snowfall. Where was I to start and to end? The fortunate decoding of a certain date of the star map proved to be the very first exact dating of this map. When this also appeared to be a tool in determining the time of Moses, all the pieces found their right place. The positive consequence of this was that here - exactly on the right track - the material itself could easily show the way. Now the text became a complete book. And quickly two books. Soon also three. Extending gradually even to five books - at one point, even six - so I disciplined myself very much to getting this truly incredible and lively material into a more limited scale - preferably without loosing anything. The entire work - so unforeseen - took more than twenty years, besides years of preliminary studies which were then crystallizing. One fine day I discovered that in reality I was on a mission. Like in the old days when the captains were sent out with their ships on dangerous and strange expeditions with sealed orders to be disclosed at the open sea only, i.e. after a long time without landfall, and being unable to reach land, for instance, by escaping using a rowing-boat. No escape possibilities. The way out is the way through - and was here - to bring back the existence of Moses into the consciousness of history. Very many essential circumstances of Antiquity becoming of importance even in our culture today stem from Moses and his time. To incorporate innumerable pieces of the wide-spread material of sources appeared to be an incredibly hard and lengthy work. Being so immensely fascinated, and despite of all the external problems and an even tough, hostile opposition, and also deep personal privations, I discovered to be simply bound to do this, no matter what. During my working with this huge writing the strangest things happened - several peculiar inconveniences got in the way together with strange but very positive events. For instance - often "in the last minute" - I had inestimable assistance from experts in Egyptology, Hebrew, Ancient Greek, etc. This was often only shortly prior to the passing away of several of these personalities after long lives of research and experience. 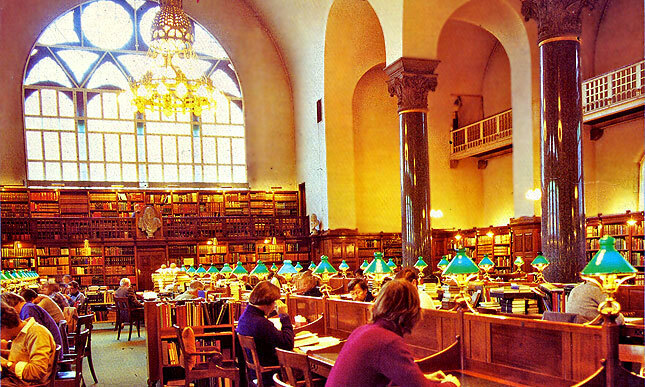 - In a longer fortunate period prior to the big, problematic rebuilding of the Royal Danish National Library, around the year 1999, I was able to use its old and immensely abundant reference library, a most paradisiacal reading room. Furthermore, this room was for a long time in reality Denmark's greatest open interdisciplinary forum (now expired) where many prominent researchers met. Argentinian author Jorge Luis Borges (1899-1986), who later also was director of the National Public Library in Buenos Aires, could view any book as being a world of forking paths, and he opens his short story "The Library of Babel" (La biblioteca de Babel, 1941) with these words: "The universe, otherwise known as the library ...". It covers precisely my own feeling and condition. It was essential to my investigations that in Denmark's Royal National Library, I had the access to one of the world's greatest collections of older Hebrew texts and literature. - Some of the best hours of my life I spent there, (see some similar impression here: Librophiliac Compendium of Beautiful Libraries). For several years at that special place, Denmark's Royal National Library - and also through its contact with foreign libraries - I borrowed and copied more than a thousand very important books, which had been out of print for a long time, besides articles and documents, exactly those I should use. This I was just able to carry out until the introduction of prohibitively burdensome high taxes or fees - all straining for independent researchers - on foreign book lending and copies. Later even the library's professional consultants and other normal assistance from specialist librarians were closed down together with other specialist library services (thus for instance hampering source searching concerning old works not registered electronically) - in reality it would have made it nearly impossible to continue the unusual extent of research which was being conditioned by the creation of the book-series on Moses. Concerning much of the collected, unusual knowledge we are greatly indebted to the élite scientists from the early period of researches, who from older vanishing cultures, often at the last minute, managed to obtain and preserve a special knowledge about man, his conduct of life and his history. Therefore, many of the early academic works are priceless which is the reason for the fact that whole annual volumes of, for instance, German scientific journals dating back to 1920's were photographically reprinted - often by American universities as publishers. I had heard about the British explorer Alfred Russel Wallace who for several years in the mid-1800's had researched the Amazon jungle - where it could take many months for him to capture, for instance, a butterfly important to his line of evidence, while he suffered from tropical diseases, poisonous insects, hostile Indians, and troublesome transport through the jungle and on the rivers with his collections and many scientific records. In the end everything was destroyed when in 1852 the homebound ship in the Atlantic burned like a torch (fire in a cargo of balm oil and resin products). On return, after 10 days in an open rowing boat, he had to write his texts mainly without notes, samples, and preparations. He then encouraged so incredibly generously his colleague Charles Darwin to hasten with Darwin's own somewhat similar theory of evolution so it could be published. That makes the impression. Now being more aware of risk (read 'anxiety') of irreparable loss, many years of my research and the amount of results and documentation I therefore copied on even three sets of disks constantly to update for safe keeping different locations. inscriptions – it spells the date equivalent to 25.Aug.394 AD. On the Internet, the fantastic tool of the new millennium, the Moses-series' own website, www.moses-egypt.net , was created by me in 1999. Around the world it was read and it was becoming very well-known internationally for its contents, and for a longer period it was placed on Google's first page at the top of 30 million entries for the index word Moses. Few years later after many millions of websites had been established it became more difficult to obtain the Moses-series' site to be found immediately. However, during the early "free" years the site had the good opportunities of receiving a huge amount of responses - much of this still being maintained on the web. On Facebook, the free-access and popular social networking website currently including hundreds of millions active users worldwide, some very interested people have established: "Interest Group for The Ove von Spaeth Papers" - namely, the Interest Group for The Ove von Spaeth Papers on History and Knowledge: - Rediscovery, Insight, Renewal. In particular dealing with: - Communication and debate on Ove von Spaeth's exploration and discoveries regarding his research on the historical Moses, the Egyptian legacy, ancient sciences and astronomy, (in English and Danish). For more than a thousand years until our recent centuries almost everybody were familiar with the contents of the Bible. Still in 1900's, the older generations in the western world have the history as a part of their learning and from their school, they own the accounts of Abraham, Isaac, Jacob, and Moses. Later, in the emerging mass culture a growing 'illiteracy' paradoxically developed during history's longest school terms - has barred new generations from much knowledge about the cultural roots - a knowledge which even the poorest children in the Middle Age had learned about. Therefore, just before the first book of the Moses-series was published, I made many special changes in the script because I could foresee that many features and subjects which generally had been obvious agreements soon could become a problem. For example, it was not efficient simply to refer to the "Book of Job", many younger readers could easily misread it as if it were a book about "how to bget an employment", but instead I had to clarify it as "the biblical Book of Job". Similar changes I had to carry out all the way, because many people no longer neither seem to know the names of biblical persons or that the Bible consists of a whole collection of individual "books". The western Christian culture was strongly contributing in making the modern world's development possible. But a particular cultural tradition with many rebels just against the Christian religion was an equally important factor for the development. Challenges to existing circumstances are, as we know, a necessary dynamic, - even also in this case, for although my books initially were met also with much hostility from certain established theologians and Egyptologists, eventually such opposition later diminished. This was often due to the fact that many new academics of these study lines simply no longer seem to have sufficient knowledge on the referred historical topics in the book-series. In many ways the situation seemed as if I was working strongly competing with time. When the first volume of the Moses series appeared in 1999, the major newspapers still had many book reviewers with their hitherto cultural background and sphere of interest - just like most of their audience. In public attention the first books of the Moses-series even get good footing. But shortly after, in the new millennium, new generations arrived with other of the modern society's new media habits and different interests. It was like standing on the boundary between two worlds and being trusted to convey a very valuable special knowledge in the best way of protection into the new era. That it just should be yours truly, a Danish researcher, who traced the facts of the historical Moses and placed the conclusive steps, was apparently contributed by, not the least, the presence of The Department of Judaica and Hebraica of the Royal Danish National Library in Copenhagen with the - envied abroad - exclusively fine and comprehensive collections. Furthermore, here in the great astronomer Tycho Brahe's native country this library owns a considerable collection of both his original texts and the related documents and literature. A great help, because in parts of my research, it was most important to be able to examine the original prints, the genuine first editions of e.g. Tycho Brahe's works (and also Shakespeare's texts). My dealing with the original prints also concerned included forms of information in older texts, a method well-known as a normal procedure of the living tradition from ancient Egypt and later with the Greeks and the Romans. - As a result of the dissemination of the art of printing, the form of code could also be found in the typography of the Shakespeare texts. In these, some names or messages have been created by a systematic use of "uneven" printing composition types - a method which specially was developed by Danish astronomer Tycho Brahe (1546-1601) who, at his observatories on his residential island of Ven, also had his own workshop for printing books - and the principle of the method was later seen also in many first editions of the Shakespeare-texts. However, such were often deleted in later editions, as it also happened in the case of Tycho Brahe, probably because non-initiated laymen assumed them to be "printing errors", which were then "corrected". By here, my old education from my teenage years as a typographer (compositor, typesetter) became a new advantage. Gutenberg's invention of mass-producing texts by composing their printing blocks of loose letter types, remained in 540 years and suddenly, from around 1980, this method of operation almost everywhere became antiquated and was now carried out by computer technique. Today, many people would hardly understand that it was not unusual in the past that different styles of printing types could be mixed by accident, so even when the spelling was correct there could be a visual mix of different styles of alphabets. Therefore, no reader would note immediately, or at all, if someone deliberately had arranged a mixture in order to form a codified message. 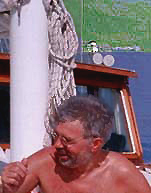 The Danish astronomer, researcher, and historian of science, J.L.E. Dreyer (1852-1926), published in 1890 in English a book about his fellow countryman and colleague, Tycho Brahe - now a standard biography and even reprinted still. Dreyer was from 1874 to 1916 the leader of several major observatories in Ireland. Later in Denmark, he published Tycho Brahe's magnum opus, the Collected Works, "Opera Omnia", a total of 15 volumes. Contributing to this, quantities of rare material of - and about - Tycho Brahe was gathered by Dreyer who often had to acquire copies of the original papers from many of Europe's main libraries, in particular the Habsburg collections in Austria's National Library in Vienna, and in addition collected through purchase at international auctions. These works in Latin he had corrected for all original scribal errors and had annotated the texts. In Copenhagen, at this incomparable Royal Danish National Library, I have sat for weeks and examined a particular heritage, namely Dreyer's boxes containing these things, including the many leaflets and pamphlets from the 16-17 centuries, in all languages from all over Europe. I was impressed by all these old prints and lampoons showing admiration and tribute to the pioneer scientist Tycho Brahe regarding his proposed prediction in his book "De Nova Stella" from 1573 - of what later was described as the Thirty Years' War in 1618 -1648, and of a Nordic (Swedish) king's conquests of the identified vast areas in Central Europe. In my research project on the historical Moses it was important that in this unique library's department of The Judaica Collection, I was able directly to access the texts of many Rabbinical Writings instead of reading them as extracts or summaries. Concerning the Bible's texts connected to Moses, I was grateful for receiving assistance from several Hebrew experts when one person's opinion alone was hardly sufficient in cases of difficult translation problems. How do we know that Moses is not a myth figure, and if the Exodus, when Moses and the Israelites left Egypt, did at all take place? Continuously - and from the very beginning of the work - such questions are being asked about the main subjects. Often this wondering proves to be influenced by the spread of several theological (and other) schools' doubts as to the existence of Moses as a historical person. The theological hypotheses concerned seem to stem from for instance the fact, that the research on Moses has often been done on the basis of a wrong dating placing him approx. 250 years too late in history - at around 1200 BC instead of at 1500-1400 BC. Consequently no traces have been found either of Moses or of the Israelite Exodus. On this inadequate basis it is often claimed today that the biblical Moses narrative is a nationalistic-romantic myth created by inventive priests approx. 2300 years ago in order to provide the Jews with a glorious pre-history. However, especially Egyptian and Jewish sources relating to Moses provide a considerable number of evident, historical traces. To a wide extent these have been ignored, often due to a rigid insistence on the much too late dating - and on the myth hypothesis, as mentioned, which reduces the most important personality behind the origin of biblical culture and of the Jewish self-understanding to be only a fictional figure. This is not acceptable, because the allegation of Moses being a myth proves to be an impossible historical construction, likewise it already would be a complete absurdity for Jews of the past. It is an object of continued wondering why traditional, academic research does not to a wider degree use the latest 120 years' (forward to the new millennium) of numerous, although wide-spread, archaeological and textual references concerning events of the times of Moses. Already when the first volume of my Moses-series was published, some indignant university people started to use less polite measures. One lecturer became angry in particular because I quoted his attacks correctly and word-for-word. In the media some of his colleagues said: that they (quote:) "will fight with these books for many years". Many readers saw this as a compliment - i.e. that the books appeared with a certain class by "being able to have shaken the academic officials". But some from these groups found it to be desirable to categorize the discoveries like in books of adventurers and dreamers, which made other academics outside the research lines in question, and even without having read the books, to use the same designations. Yet our knowledge of the past is much more abundant and also more accessible than usually assumed. Ironically enough, so many data about what we call myths can be found at libraries and museums around the world collecting dust, almost without being known or studied. A considerable amount of the exactly in reality existing and relevant, historical sources about Moses is included in the books. Most of them for the first time related to modern archaeology and astronomical dating. The extremely huge material about Moses makes it pointless to claim that he should be a mythical figure - on the contrary, historical and biblical information about Moses as an exact figure is emphasized thoroughly and substantially. An unrealized problem is the fact that biblical text research started before archaeology was scientifically established. Along the way from the many seminal text discoveries, and soon more firm conclusions from mid-1800 and up till present (around year 2000) research, hypotheses appeared about the possible and non-possible relations of these findings - in attempts to understand the history behind the Bible. Thus, hypotheses were constructed especially about "Moses as a myth". And later in many cases, they had got established a huge, surrounding literary devise. Consequently, later generations are being confronted with a still up-generated system of comments' comments. In this way new students are often uncritically given the impression that the hypotheses are mostly to be considered the authoritative truth. Therefore, in the actual analysis work, which is the foundation of the Moses book-series, it was necessary for me in many cases to go all the way back to sources of previous generations of researchers. I did so in order to get the best possible direct knowledge (even also from excavation reports, for instance) about the findings as well as the way the results of research had been obtained. So instead of only taking for granted the later further extension, it was often decisive to have the very starting point analysed in relation to later findings and discoveries. The synthesis of material of the books - not seen previously to this extent in the Moses research - implied that this inter-disciplinary work would hardly have been produced without the help of many competent and interested researchers. Also other capable helpers deserve my sincere thanks. During times several researchers have had inquiries about delivering novel writing, - from their readers who would like to have a look into the exciting information, however, preferably via fiction as being the well functioning way of communicating. To some people source references are a pleasant confirmation of quality of information or an interesting extra information along the way - others, however, understandably, see this as too many traffic lights, hampering the reading velocity a little too often. Many scientists have used the novel version, when they wanted to launch or try out new ideas - all of which, for general reading, is a handy but also more responsibility-free communication. A project of this kind concerning a new understanding of the special background of Moses has not previously been carried out - and if the discoveries presented had been described in such a way that they would be less accessible for control they might incidently risk being perceived as less usable in practice as well as for serious assessment. Therefore - no novel, but some given subjects engaging by virtues of their own and of most important relevance. By themselves these will even offer further perspectives - also concerning new ways of thinking which, in the not so long term, will be necessary within the actual religions. The pioneering research and the special historical material in my texts altogether with the untraditional results seem to have waked a considerable attention internationally among other authors and scientists. (cf. : http://www.moses-egypt.net/vonspaeth-series/ovs-authordata-2_en.asp). In these books about the rediscovered background of Moses, the very history concept is in practise being extended to the effect that also a number of magical and spiritual conditions are mentioned equally with other historical events. The history of Moses and Egypt can not possibly be understood if these elements - when really belonging to history - are without being shown attention. Also on this background, the books therefore bring to light for instance the mystery plays of ancient Egypt, 'masonic'like rituals, magic, ritual healing, astrology, religious royal power. 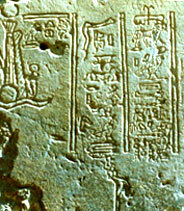 And for instance also inscriptions about the magic used by ancient kings and generals. In addition, oracles, divine conception, star knowledge mythology, and cosmology. Sublime impressions from a culture comprising penetrating spirit - thus having here found its expression in spiritual architecture and art, surpassing most of what is familiar from any known civilization. When we meet it now, several thousand years later, it still affects us. In the books, among some of the information - also with new angles to mysteries and ancient initiations cultures - several readers have recognized masonic and similar groups' early-history circumstances. This is where these books have tried to pass on some fundamental, often forgotten features still bearing exact resemblance with historical events known from the world of Antiquity. Not least the Egyptian inspiration is supplementing and putting into perspective the subject and our understanding. And in this context the books are focusing on these spiritually founded conditions in the Egyptian past and from there bringing to light several, also general traces behind present culture and history. A reviewer expressed his understanding of the books like this, "Moses was born to become a pharaoh in what was at that time the mighty Egypt, and was initiated in the ancient, esoteric wisdom - and concerning intelligence he was by far surpassing his contemporaries. Obviously, he was a highly advanced soul meant to lead human beings one step further into evolution". The Bible, as well as the ancient Rabbinical Writings, and many of the ancient, learned writers mention that Moses was known as the Son of Pharaoh's Daughter. My book-series about the historical Moses was given the unusual title "Assassinating Moses" on the background that three times in history it was attempted to destroy Moses: - First, by the Egyptians, rejecting him as their heir to the throne and already in his time removed his names and other memories about him, in order to making him non-existent. - Later, by the priestly editors of the Bible, such as Ezra in approx. 350 BC who reduced the Egyptian background and status of Moses. - And finally, many present theological schools reject the existence of Moses and designate him as an imaginary, mythic figure. Consequently, in some groups the books are considered strongly controversial, even heretic. By means of reconsidering the identity and background of Moses, his fate and mystery, the books are bringing to light the replaced and repressed historical existence of this personality of early history, who to us represents the great man straddling the dividing line between history and prehistory and who even created this line himself. By this context the first volume of the series - commencing publication in 1999 - was named "The Suppressed Record" (C.A. Reitzel Publisher and Bookseller, Ltd., Copenhagen). Each of the five books of the series is an independent volume and can be read individually. All of these books of my Moses-series represent a new-orientation also with perspectives for research so far done in these fields - now being on its way into transformation. And in our religious learning and comprehension for the present, a cosmological insight will have to be included again. Together with his advanced initiation and education in Egypt many indications show that Moses carrying with him religious 'secrets' at the Israelite's Exodus from Egypt. Apparently, now is the time for many of the exciting questions in this relation to be solved and several enigmas will face their solution. Dansk tekst /text in Danish: "På sporet af Moses' arv fra Egypten"
The book-series on the historical Moses has been finalized, February 2005. A small retrospect: After nearly a dozen years of several surprising discoveries, sometimes a little unexpected, followed by a necessary continuous research and studies in order to get deeper into the subjects - and added to this, publishing of a number of articles about the achieved results - the idea crystallized about structuring the eventually huge material into an extension comprising 5 volumes. Which took the next 5 years. However, nobody had ever written five books on this part of the important, ancient history concerning Moses, the still existing tracks, and his importance in our early culture - not even a two-volume work has ever been done. And now - not at all foreseen - the proportion required not less than 7 years of further intensive testing of materials and results - and an almost impossible molding-process to connect the many thousands of sources/fragments to constitute a genuine and evident completeness. In addition, a current updating incessantly throughout the years. And in the final phase, a technical finalizing for the printing of all the volumes of the series, which were published during 6 years with approx. one volume a year. Leaving out of account a previous preparative period, it turned out to be a longish stretch of 18 years, of which a great part of the time had to be used also for daily bred-and-butter duties. This is to extend sincere thanks to researchers and other devoted helpers (some from the very beginning), who have all helped with tireless efforts and shown great confidence and a courageous personal support, despite resistance against the project from other parts, which could have caused annoyance from academic colleagues. 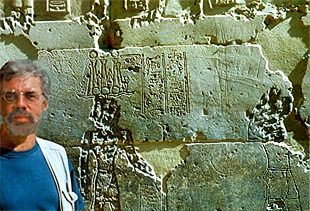 For instance, already upon publication of the first volume, some Egyptologists from the universities declared openly in the Berlingske Tidende (a renown Danish newspaper) on August 3, 1999 that they (quote:) - would "fight against this book for many years to come" - and, also, many academic colleagues, especially the theologians followed this lead continuously. Yet - despite all the peculiar troubles, also in the technical matters - all perseveringly overcome - the 5 volumes are now published, and the series are handsomely finalized. Therefore, also thanks for the great confidence and back up, very faithfully done by Mr. Svend Olufsen, the courageous - and visionary - head of C.A. Reitzel Bookseller and Publisher, Ltd. In Denmark the publication of the long-term work of research was so admirably done despite the above mentioned opposition and without in any way having received financial aid or any other kind of support from either private or public means and funds. And in particular a special thank you to the readers, who have contributed with their encouraging interest and many responses to the dissemination of the knowledge. During the course of the book-series, this has been of most valuable importance for the process of making it into a reality with such a success. Thanks a lot for inspiration, great help, and backing up.